Maintaining creativity can be difficult for artists at the best of times. Fortunately, there are ways to combat the dreaded artist’s-block. Carried around in the crook of many an artist’s arms, the visual diary has developed alongside the very beginnings of art history. Famous artists like Leonardo da Vinci, Frida Kahlo, Vincent van Gogh and Kurt Cobain all kept detailed visual journals for their thoughts and creative progress. Cecil Beaton, famous for his portraits of Marilyn Monroe, religiously kept scrapbooks of drawings, newspaper clippings, paintings, and copious amounts of photographs. Art school curricular also relies heavily on the use of a personal visual diary to detail a student’s thoughts and processes. Materials in a visual diary aren’t limited to just pieces of paper. Here I’ve fixed a piece of plastic that I wanted to use later into my visual diary for safe keeping. Keeping track of different film I’ve used is easy with a visual diary – I simply stow the flattened box for later reference. What is a visual diary? 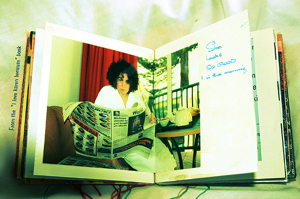 As the name suggests, visual diaries are a collection of visual references compiled by an artist. Made up of notes, diagrams, collage, photography, images, and detritus, a visual diary can contain any number of materials compiled into a series of books or folders. The purpose of a visual diary is to provide space for an artist to work within visually. By documenting your own progress and inspiration in a physical diary, you can build important skills and identify trends to further your creative skill. A visual diary also provides a cathartic space to record ideas and personal observations. You can combine private journal entries with test-prints and swatches, or you can keep a strictly photo-based body of work. You can even use separate books for separate media or projects. It doesn’t have to be pretty, as long as it works for you. Proof sheets of negatives are most useful when stored in a visual diary for easy reference. What diary should I use? One of the most popular formats of visual diaries is spiral-bound booklets. These booklets can be laid flat on a surface and have thick paper for sketching. Plus, you can stick a pen down the spiral joint so you’ll always have a marker at hand. A4 and A5 booklets are generally the most popular sizes for visual journals. Larger journals are harder to transport and a very small booklet may be too little to stick cut-outs in. Lined and unlined booklets are another consideration. I personally prefer an unlined book – every sheet is like a blank canvas as it holds nothing but potential! Having said that, grid books can be useful for structured lighting diagrams and geometrical drawings. An alternative to keeping a booklet as a visual diary, mood boards are another great way to maintain inspiration and direction. Having a mood board to look over and update frequently can be just as beneficial as having a visual diary, only it’s a little less portable. All you need is a good cork board, a few pins and a choice selection of images and notes. You can even use several mood boards, each sectioned off for different moods or projects. Keeping a mood or cork board full of artistic material can be a great source of inspiration for projects. Why keep a visual diary? There are many benefits to keeping a visual diary. Organizationally speaking, having a visual diary keeps all your artistic detritus in one place. I’m definitely guilty of spreading my materials out, scribbling notes on bits of paper and losing them shortly after. Writing notes in your journal or taping pieces of paper with notes into your diary will keep them together so you can easily refer back to them later. Visual diaries are also great for unexpected flashes of inspiration – try keeping one next to your bed for those breakthroughs in the middle of the night. Your visual diary is your own personal work space. Recording your artistic progress now will create a timeline of your personal development to refer back to later. This can help maintain your focus or realign your artistic direction. Once you get into the habit of filling in your visual diary, you will develop a pattern of creativity, training your photographic eye. Plus, if you aren’t keen on posting personal thoughts in an online blog, paper-based visual diaries are a safe space for your own creativity. Visual journaling is good for your health too. Cutting images out and doodling in your visual diary can be a very meditative process, increasing mindfulness and reducing stress. Simple tasks like cutting and pasting photographs clear your mind of negative thoughts with repetitive motion and critical thinking. Negatives and digital proof sheets that need to be close at hand for projects are easy to find and revise in a visual diary. Keeping a visual diary is a great way to boost inspiration, consolidate thoughts and even improve your mental health. As a placeholder for ideas and reference material, keeping a visual journal will quickly become an invaluable tool for developing your photography. Think of it as an artistic space, created and curated by you! Visual diaries are not only great for storing inspirational material but for recording things like photography expenses or even your wish list.